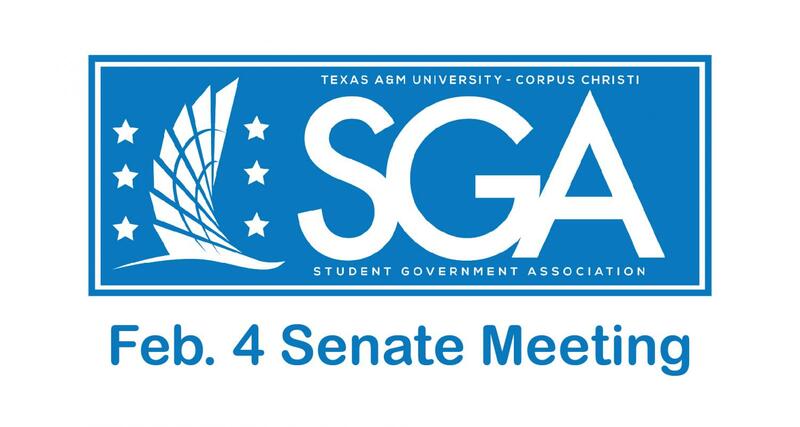 Senators and chairpeople gathered for SGA’s weekly meeting last night, Feb. 4. The main conversation centered around proposed bills and resolutions, including changing senator appropriation, bettering dorm safety and mandatory election campaigning. President Connar Allen started the meeting off by giving a presentation about a proposed change to Senate that’s focused on making it more representative of college’s populations. One question was if students would even want to fill more seats in the Senate if they became available. A concern was the possibility, in the future, if TAMU-CC grew exponentially, a mass majority would easily form and potentially sway votes. A bill or resolution has not been proposed yet, but we will update on that when it does. S.R. 28-5 Surveillance Resolution was quickly introduced by Freshman Sen. Stormie Gutierrez and resolved yesterday in response to the break-ins at Camden Miramar. Three students’ rooms were reportedly broken into, including Gutierrez’s. Since resolved, a formal letter will be sent to American Campus Communities to ask for installation of CCTV cameras in stairwells, entrances and exits. The last new business was the contended S.B. 28-7 Election Code Bill introduced by Scheick. This bill proposed making campaigning optional during elections for SGA candidates. Disagreements arose between making sure that constituents are aware of their representatives and allowing candidates to show effort through campaigning. After much deliberation, the bill was reformed and enacted with the revisions that candidates will still have to campaign, but they will not have to do so over online platforms. “I better see everyone running for reelection having an on-campus flyer posted because you wanted them,” said Scheick after the reformed bill was enacted. What are your thoughts? Should our Senate size be more representative of college’s populations? Tell us what you think on any of our social medias @islandwavestogo. Interested in running for Senate and ready to campaign? Sign in to I-Engage at, https://tamucc.campuslabs.com/engage/, and apply under the “Forms” tab. Go Islanders!